Michael Amis, 34, of Pepper Drive, Burgess Hill, was fined £484 and must pay £48 victim surcharge, £85 costs, after admitting harassment in Lancing through numerous unwanted Instagram messages, after being told to stop, and two home visits without consent between May 24, 2018, and May 30, 2018. He was also given a restraining order. Michael Biffi, 28, of Seaton Park, Wick, was fined £120 and must pay £30 victim surcharge, £85 costs, after admitting drug-driving (2.7mg THC per litre of blood) in Lyminster Road, Littlehampton, on May 16, 2018. He was disqualified from driving for 36 months. Ashley Gartell, 24, of Oakleigh Gardens, East Preston, was discharged conditionally for 12 months and must pay £20 victim surcharge after admitting stealing two Lego Star Wars sets and 34 packs of Pokémon trading cards worth £161.64 from Beales, Worthing, on July 17, 2018. 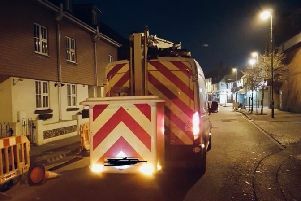 Matthew Stone, 28, of Dorset Close, Littlehampton, was fined £153 and must pay £80 compensation, £30 victim surcharge, £85 costs, after admitting causing £80 damage to the driver’s window of a van in Rustington on August 7, 2018. He was also fined £153 after admitting resisting a police constable in the execution of her duty in Littlehampton on August 7, 2018. Caitlyn Welch, 21, of Norfolk Road, Littlehampton, was fined £80 and must pay £30 victim surcharge, £85 costs, after admitting assaulting a police constable in the execution of her duty at Worthing Police Station on August 7, 2018. She also admitted breaching a suspended sentence order, no action taken. Philippa Davis-Higgins, 52, of Seaview Avenue, East Preston, was fined £150 and must pay £30 victim surcharge, £85 costs, after admitting driving over the 30mph speed limit in Kingsway, Hove, on September 24, 2017. Her driving record was endorsed with three points.